Characters from this year's Best Picture nominations get the illustrated treatment. The Oscars are almost upon us. Whether you indulge in the awards ceremony or think it's just a self-congratulatory pat on the back, the Oscars are a great opportunity to pause and reflect on the state of current cinema. There's also the chance there'll be a hilarious gaffe like last year's Moonlight/ La La Land mix up. There's plenty for designers to get excited about in the run up to the Oscars, with some using the awards as an opportunity to offer their own creative spin on the year's biggest films. Take illustrator Olly Gibbs, who has been creating amazing illustrations of Oscar hopefuls since 2014. "I thought it would be a fun idea to represent each Best Picture nominee by dressing up the Oscar Statue in the costumes from the films," he explains. "I continued to do this each year developing the idea a bit further by introducing props and other elements to help show the film more as in some cases a costume wasn't enough." The project started out as an Oscars game for Empire Magazine, but when this fell through Gibbs kept on creating the statues to hone his illustration skills. "Each year the statues become more refined and more detailed," says Gibbs. "If you compare the first set I did with this year's you'll see a massive difference in detail and connection with the film. I do it all in Adobe Illustrator and tend to a lot of research before hand working from trailers and released film stills." 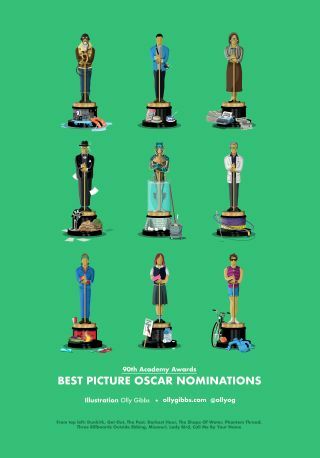 Check out the full gallery of this year's Oscar illustrations below. Will Three Billboards Outside Ebbing, Missouri win big at this year's Oscars? When it comes to creating his illustrations, Gibbs always tries to be as accurate as possible while creating a cohesive collection. "Colour is also key when creating the final piece as I try to strike a balance with all the statues so I will determine which costume to choose (if there are multiple) by how it works with the others," he reveals. "I also like it when there's one that stands out a bit more than the rest. Last year I did Amy Adams in the orange hazmat suit from Arrival and that made for a really striking image. This year Guillermo Del Toro's Shape of Water allowed me to create a non-human statue for the first time - this was by far my most favourite one to create and probably the most beautiful one yet. I worked hard to be as accurate to the costume/character as Del Toro's designs are always stunning." Having posted his Oscar illustrations since 2014, Gibbs' creations have started to take on a life of their own. "I'm always blown away by the responses each year I post these and this year was no different," he says. "I had a lot of people emailing and commenting when and if I'd be doing them which was nice to see. "As far as what's next I have a few ideas and one of them is to work with a 3D artist to create them in 3D and get them 3D printed. I've always wanted to see them turned into sculptures although I'm not sure where to begin with that! If not I'll just stick to illustrator and focus on improving the illustration technique!" The Oscars take place on 4 March.